Lord, you sent Blessed Dominic to seek out the lost sheep of your flock by preaching your truth and witnessing to your love. May we follow his example and build up the unity of your Church as a sign of faith and love. Amen. Aston Hall was the first Passionist foundation in England. The Passionists arrived there on 17th February 1842. It was the feast of the Nails and Spear of Christ Crucified according to the Order’s calendar. The locality pleased Blessed Dominic very much. It reminded him very much of his own Tuscan countryside. The house was surrounded by extensive grounds ‘twice those of Ceccano’, and was bounded by a moat in ‘perfect solitude’ with twenty rooms, and an adjoining church sufficiently large, and equipped with organ and sacred furnishings. But the symbols of the Nail and Spear was soon discovered. The priest who up till then was in charge of the district, was so taken by the house that he was still in residence when the two priests and two lay postulants arrived, and they couldn’t easily get him out. He was to stay on for a few months yet. Also, the three hundred parishioners had been warned against ‘these black men from Italy’ and they were not happy about receiving their spiritual care from foreigners who neither spoke their language nor understood their outlook or way of life. COnsequently, their arrival met with a disgraceful and irreverent scene. The people even wished to intimidate the superior by leading him to believe that his very life would be in danger if he remained there. In his charity, Dominic put a lot of the rejection down to himself. He noted himself that the English were greatly influenced by appearance, speech, manner, etc. “In his secular dress he was a holy show. His suit was in a style unknown to English tailors; it was neither clerical nor lay; wholly incorrect; where it did fit it was badly buttoned. On his travels he carried a watch that could have served as a town clock among the Lilliputians; it had to be adjusted every five weeks. His waist coat looked like that of a itinerant hawker. His trousers evidently were made regardless of the length or width of his legs. His shoes perhaps had some service in Noah’s Ark. To crown all, he used the poorest and shabbiest hat to be seen in England, outside the collieries. Fr. Dominic was a humble sort of person and so was undaunted by the laughter and smiles of the people as he tried to preach. He decided to give the people a little MIssion as preparation for Holy Week. So he preached his first full-length sermon on Passion Sunday, 13th March 1842. The English of his extant manuscript was fairly good, but his delivery and accent were bewildering. In the end, he won them all over and the converts began to multiply. 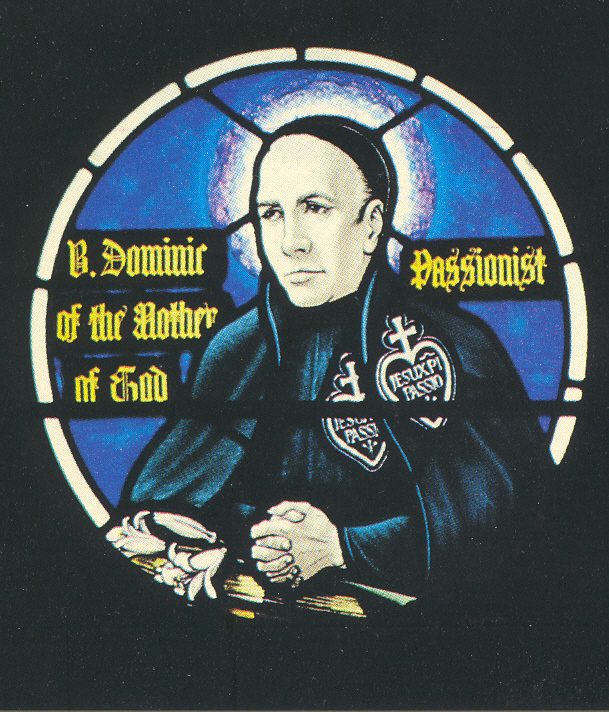 For seven years Dominic preached missions and retreats all over the country. And when death overtook him his body was brought back to these people at Aston that he had come to love so much. Blessed Dominic was a very learned, well read person but he had a lot of trouble with pronunciation. Living in an Italian community, he had no one to correct him. The other priest, Fr. Amadeus, though born in Ireland, had spent most of his life in Italy, and his thick Irish brogue, intersperced with Italian expressions, made him even harder to understand than Fr. Dominic. There are some stories worth recording about Dominic’s problem with pronunciation. “I wish to say a few words for your edification, but I cannot do it because I am not yet able to speak English. However, I shall say something – a very short sermon. My dear beloved, let you love one another because they who love their brothers accomplish perfectly the will of God. Let you love God and men’s for God’s sake and you shall be perfectly happy for ever. Amen.” (MSS, iv, ii, i). (“Fr. Julian Tenison Woods and the Passionists”, Fr.Gerard Mahony, C.P., Passionist Via, December 1980).